In Working With Clients you will gain valuable insight into how to practically work with clients. We will take you through environment and equipment considerations, and what you will need to get started whether your budget is in the hundreds, thousands, tens of thousands or more! You will learn exactly how to run appointments like an expert from the start, and have the guesswork taken out of interacting with clients. You will have access to exclusive video footage recorded live of a full introductory appointment from welcoming the client, to teaching the exercises, to ending the appointment. These videos condense over a decade’s worth of experience of introducing clients to High Intensity Training; from enabling the client to understand HIT from the outset, to doing and saying what is needed to ensure that they become a long-term client.You’ll then learn how to select initial weight loads for new clients. We then go beyond the introductory appointment to look at how you should run and teach regular clients’ appointments including how you should behave during the client’s workout and how to coach effectively. You’ll learn how to start an appointment, how to instruct throughout the workout and how to end the appointment. You will discover what information you need to track, how to record it and where to keep that information. We’ll then take a closer look at progression on the week-by-week basis, when load increases are needed, and appropriate transitioning of clients from beginner to intermediate to advanced levels. 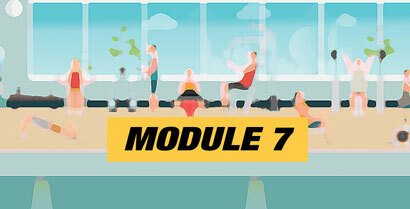 Included in this module are 17 written scripts that you will use as templates for addressing exercise concepts with clients, along with a list of the 45 most important and effective verbal cues to use whilst the client is exercising. Also included is the official HITuni workout tracking sheet that you can use on your computer, laptop, tablet or smart phone, or even print out if you prefer to use a pencil!